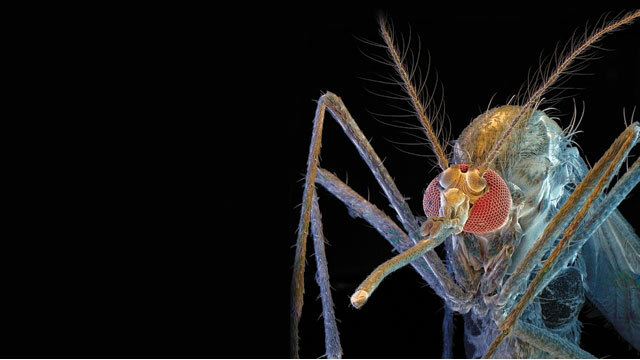 The global spread of dengue virus has immunologists and public-health experts debating the best way to curb infection. © DAVID SCHARF/GETTY IMAGESIn 1961, during the first dengue outbreak physician Scott Halstead ever witnessed, children poured into Bangkok’s hospitals, passing and vomiting blood, faint from blisteringly high fevers. Twenty percent of the children would die within a few days as doctors scrambled to find treatments, with some in nearby Vietnam even plunging children into ice baths in an attempt to hold down their soaring temperatures. The deadly illness caused by dengue virus wasn’t yet known as dengue in Thailand; doctors there referred to it as “Chinese medicine poisoning” based on a demographic quirk. Although half the city’s population was Chinese, the only time Thai doctors—who practiced Western medicine—treated Chinese children was when the children had been stricken with this mysterious, deadly illness. Thus, doctors imagined that a horrific poisoning caused by Eastern remedies was responsible for the influx of Chinese patients. Instead, Halstead explains, Chinese parents had quickly learned that the hospital, rather than traditional medicine, was the best bet—however slim the chances—for defeating dengue. Halstead who was drafted into the US Army after World War II and originally sent to Japan in 1957 to study encephalitis, had just settled into a lab across the street from the Children’s Hospital in Bangkok. “Everything I’ve ever done,” he says in retrospect, “is related to the treatment of dengue.” In the years that followed, he and his colleagues identified dengue as the cause of the outbreak and began tracking the four different versions of the virus, each transmitted by mosquitoes. Among their seminal discoveries, the researchers learned that the hemorrhagic disease that they saw in 1961 was most common when a child is infected with a second type of dengue—a finding that would prove pivotal in the decades-long search for a vaccine that continues today. The World Health Organization estimates that more than 2.5–3 billion people, or more than 40 percent of the world’s population, are now at risk of being infected with dengue—including some in the developed world. But as research efforts have evolved, so has the reach of dengue infections. The disease has now become prevalent in more than 100 countries, causing as many as 100 million infections per year. And it’s still spreading. The World Health Organization (WHO) estimates that more than 2.5–3 billion people, or more than 40 percent of the world’s population, are now at risk of being infected with dengue—including some in the developed world. In the past few years, cases of dengue have popped up in Texas, Florida, France, and Croatia. Of the 500,000 cases of severe dengue requiring hospitalization and the roughly 24,000 deaths they cause each year, most are in children, according to the WHO. And control measures have been met with challenges. One high-profile vaccine trial conducted by the French vaccine company Sanofi Pasteur partially failed last year, leaving investigators scratching their heads. The defeat comes amid fears of some researchers that vaccines have the potential to exacerbate a dengue infection rather than protect against it. “We’re in a mess,” Halstead says bluntly. 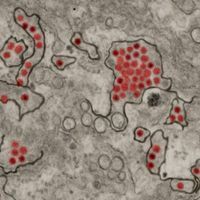 When Halstead started digging into dengue in the 1960s, only a handful of countries were home to all four types of the virus, which represent four separate viral jumps from monkeys to humans between 100 to 800 years ago, according to the US Centers for Disease Control and Prevention (CDC). But in the decades since, the four types—simply called dengue 1, 2, 3, and 4—have independently made their way around the globe. Poor urban planning and warming climates are partly to blame, having opened new territories to the mosquitoes that carry the virus, and global travel and trade have provided the necessary transit. Tires may be the best example of mosquito and dengue transport: shipped across the globe on barges, tires collect water rings that offer mosquitoes first-class tickets to new locations. Consequently, dengue’s vectors, Aedes aegypti (the yellow fever mosquito) and A. albopictus (the tiger mosquito), have surged in new locations in Central and South America, Australia, and even in the lower United States. The yellow fever mosquito is particularly insidious, biting during the day, and able to spawn in water-filled crannies no larger than a small cup. Its eggs can withstand drought conditions, allowing the population to quickly bounce back after a dry spell. It is now a common pest of dense urban areas—bringing disease with it. After a cluster of dengue infections struck continental Europe, the European Union (EU) provided funding in 2011 for researchers to assess where dengue would strike next, amid fear that dengue would continue to spread in the developed world. The disease has traveled so quickly that “we only have estimates of the global burden of dengue, which is astonishing,” says epidemiologist Simon Hay of Oxford University, who is part of a consortium that’s developing risk maps of future dengue spread. The group is currently working on a map of where the disease exists now; only later will it work on how warming climates and city sprawl might change the map, says Jane Messina, the head medical geographer on the project. Concerns have flared over the possibility that dengue could easily become endemic in Europe and in the United States, which had its own cluster of infections in 2012 in Texas and Florida. Ae. aegypti is now found in 23 states and A. albopictus in 26. “Dengue can occur anywhere the mosquito vectors occur,” says Ronald Rosenberg, the associate director of the CDC’s division of vector-borne diseases and a member of the WHO’s committee on neglected tropical diseases. Concerns have flared over the possibility that dengue could easily become endemic in Europe and in the United States. If experience from abroad is any indication, the economic impact of a dengue epidemic could be huge. Though severe disease is usually rare, it creates a big burden on health-care systems, says microbiologist and dengue expert Aravinda de Silva, of the University of North Carolina at Chapel Hill, who works in Sri Lanka where dengue has long been endemic. “Hemorrhagic fever is a massive concern. Every parent is terrified of their child getting it,” he explains. Parents often bring their children into the hospital at the first sign of dengue infection, which leads to many unnecessary hospitalizations—and the costs add up. With precautionary care as well as treatments for those who do get severe disease, dengue outbreaks weigh heavily on local economies—an outbreak in Thailand in 1994, for instance, cost an estimated $51 million, not including dengue prevention programs. Such an economic strain has brought the infection to the top of priority lists in health ministries around the world. The global spread of dengue over the past 3 decades, however, has driven more resources to research on how the virus spreads and how it can be defeated. Before the name “dengue” caught on in the Americas, it was often referred to as “breakbone fever,” or la quebradora in Spanish. The nickname refers to the crippling aches that come with infection. 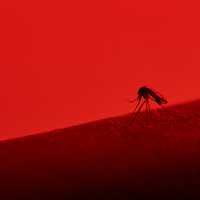 Once delivered by a mosquito, dengue virus hijacks skin and some immune cells and hitchhikes through the lymphatic system, infecting other tissues and organs and loading the bloodstream with viral replicates. The body’s immune system counters with blazing inflammation, causing sharp pains in muscles. Eighteenth-century reports of dengue infection describe the wretched gaits of patients as they staggered on swollen limbs, often in a stupor from fever. For the lucky, those will be the worst of their symptoms. Others, however, can develop life-threatening disease. If the inflammation firestorm gets out of hand, it can damage the lining of capillaries—the smallest blood vessels—causing gaps through which blood plasma can seep. Systemic internal leaking quickly leads to a drop in blood pressure, followed by shock, organ failure, and massive bleeding. Between 2005 and 2007, Managua, Nicaragua, saw a mysterious spike in the number of children entering hospitals with dengue hemorrhagic fever and shock syndrome. Since the 1980s, the neighborhoods around the city had been riddled with Ae. aegypti as well as the four dengue types they carry, but no one knew why so many more children were suddenly developing severe disease. Infectious disease researcher Eva Harris and her team from the University of California, Berkeley, and the Nicaraguan Ministry of Health had been working on infectious disease there for decades, and noticed severe dengue disease occurred in children reinfected with a second type of the virus, similar to the pattern Halstead saw in the 1960s with second infections. Simona Zompi, an immunologist working on Harris’s team, was dissecting the immune system’s response to dengue. When a person is initially infected, the dengue viral particles attack skin and immune cells by latching onto receptors on the cell surface. 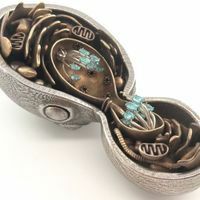 The cells enclose the viruses in a sac—a process called receptor-mediated endocytosis—that would normally digest the viral captives with enzymes in an acidic milieu, like a piece of food in the stomach. But dengue virus particles escape digestion by rearranging their envelope proteins to fuse with the sac’s membrane, opening a channel through which the capsid-encoated viral genome is released into the infected cell’s cytoplasm. 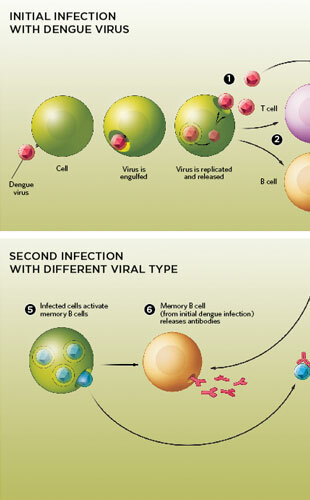 Once free, the virus usurps the cell’s machinery to create a viral factory, triggering a full-blown dengue infection. 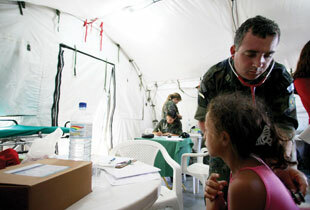 FREQUENT CHECKS: A young girl is examined by a military doctor 45 miles away from Rio de Janeiro, Brazil. The Brazilian military set up three field hospitals to help manage patients with dengue infections.© ANTONIO SCORZA/AFP/GETTY IMAGESHowever, this protective immune response depends on whether antibodies can bind strongly enough to coat and disable—or neutralize—the virus, Zompi explains. 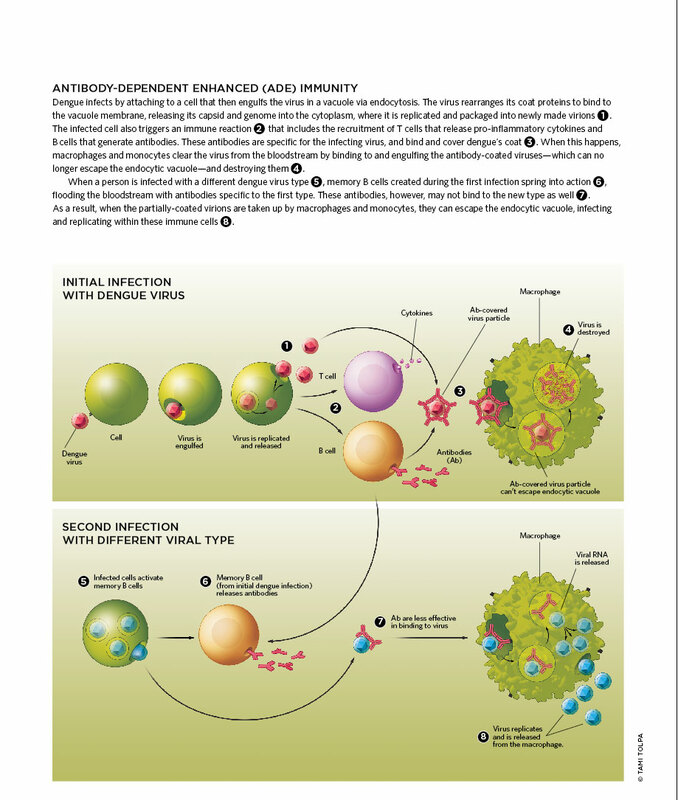 Some antibodies bind poorly to the viral particle and, as a result, only a few manage to cling to the virus, which is just enough to entice macrophages and monocytes to engulf them. However, without complete antibody coverage of the viral coat, the virus can still escape from the endocytic sacs of the macrophages or monocytes and take over the very cells that have engulfed it. (See illustration below.) Now, the virus has an additional pathway to enter cells: all of the immune cells recruited and activated by the antibodies could potentially become virus-producing factories. Thus, antibodies with poor binding affinity and neutralizing potential effectively boost the infection, and the inflammatory response can crank to inferno levels, causing hemorrhagic fever and shock syndromes. 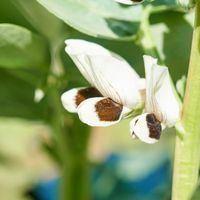 Scientists refer to this explanation for severe disease as “antibody-dependent enhancement” (ADE) of the immune response. Most antibodies generated against a specific dengue type, dengue 1 for example, will bind well and be able to thwart future infections of that type. But when a new type of dengue invades—dengue 2, for instance—the reactivated dengue 1 antibodies may only partially recognize the virus and thus lead to ADE. Indeed, Harris and Zompi found that as the predominant circulating dengue virus type switched in Managua, patients hospitalized with dengue made the strongest antibody response to a dengue type from a previous infection, not the current infecting dengue type. And most countries are infested with the four types of dengue that can fluctuate in prevalence. Some researchers worry that vaccines designed to spur antibody production might instead trigger ADE if the B cells generate low-affinity antibodies rather than those that completely blanket the virus. If that were the case, being vaccinated could predispose children to ADE. View full size JPG | PDF© TAMI TOLPABut not all dengue researchers are convinced that severe disease can be explained by the ADE response, says de Silva. There are two competing hypotheses about how severe hemorrhagic and shock diseases might unfurl: other immune cells, such as T cells, may present different fragments of the virus to the immune system, stimulating a greater inflammatory response; or, more virulent subtypes of each of the dengue types may trigger the more severe immune reaction characteristic of ADE. But the antibody hypothesis is certainly the front-runner, de Silva says—especially after his recent discovery of how dengue-neutralizing antibodies work. During initial infection, the human immune system makes a range of antibodies with different affinities to the virus. The antibodies capable of neutralizing the virus apparently latch onto a wedge between two adjacent molecules of an envelope protein on the coat of the intact virion. The new finding is significant because it casts doubt on past immunology and vaccine-development studies that have focused on generating an antibody response against only a small fragment of the envelope protein in isolation. Antibodies that don’t neutralize the virus by binding to the wedge may be candidate ADE generators, says de Silva. Yet many researchers in the field are reluctant to acknowledge the new complication, says Halstead. “A lot of people don’t like to have to address [the possibility of ADE] head on,” he says. Indeed, current recommendations by the WHO on conducting clinical trials of candidate dengue vaccines don’t include specific guidelines for ADE. In fact, ADE and its potential causes are considered a hypothetical concern that should not interfere with development of a vaccine, according to the WHO. “[ADE] may not be a concern, in my own opinion,” says infectious-disease researcher Claire Huang, of the CDC’s division of vector-borne diseases, echoing the WHO’s stance. Along with a team of researchers at the CDC, Huang has been toiling for years to develop an effective vaccine, and is working with the commercial vaccine developer Inviragen on a vaccine now in Phase 2 clinical trials. It may be more complicated, she adds, but most antibody responses are protective and robust. The vaccine she’s been working on is tetravalent, meaning it’s designed to generate antibodies against all four types of dengue. Huang and her team borrowed the genetic backbone of an earlier successful vaccine against the type 2 virus, and dressed that genome, with its attenuating mutations, in the other three viral coats, creating four recombinant viruses. “From the outside, they all look like either dengue 1, dengue 2, dengue 3, or dengue 4, but inside they’re all the same attenuated virus,” she explains. The team hopes that the vaccine will produce a suite of neutralizing antibodies against all types of dengue. So far, the results look promising. The vaccine sailed through Phase 1 trials, proving safe in healthy children and adults in Colombia and the U.S. who had no prior exposure to dengue. But the earlier tetravalent vaccine made by Sanofi Pasteur also had great early results. After buzzing through initial safety tests and Phase 2 trials, that vaccine moved to a Phase 2b trial, which enlisted 4,000 school-age children in Thailand’s Ratchaburi Province. The vaccine required three shots over the course of a year, and in September the company revealed that only 30 percent might be protected, although none of the results were statistically significant. “I looked at the vaccine results and wondered if they had given people water,” Halstead says. “It was very surprising,” echoes de Silva. It’s still unclear what went wrong, he says. The vaccine showed 80 to 90 percent protection against dengue types 3 and 4, and around 60 percent protection against dengue 1. But it failed at protecting against dengue 2—the dengue that was circulating that year at high levels. The question we’re left with, de Silva says, is whether that virus was just a mismatch with the vaccine, or if the dengue 2 portion of the vaccine simply didn’t generate a good antibody response in the vaccinated children. The only triumph of the trial was that it didn’t show an increase in severe disease. Of the 4,000 children vaccinated, only five developed severe disease. “The vaccine was still very safe,” says Dan Stinchcomb, cofounder and CEO of Inviragen. “[The Sanofi] vaccine is somewhat similar to ours, and the trial laid to rest one of the biggest concerns,” he says. The study demonstrated “that if you’re not fully protected against all four viruses, then you’re not more susceptible to severe disease,” or ADE. But Halstead points out that the trial only followed children for a year—not long enough for them to become infected a second time. In that time frame, it’s impossible to know if the risks of ADE are actually diminished, he says. In the meantime, others are looking to non-vaccine strategies to contain the disease. Despite the potential for spread in the developed world, most global health experts are focused on developing countries. With advanced water-management systems, responsive public-health programs, and effective disease monitoring, dengue outbreaks in the U.S. or Europe have a good chance of being quashed quickly, says Rosenberg. “The risk pales in comparison to the daily risk of getting dengue in the tropics,” he adds. Because of logistical barriers in developing countries, some experts doubt that vaccines are the best answer to the dengue problem. “Implementing a vaccine is difficult,” says Rosenberg. For example, if the vaccine requires multiple boosters, most people in low-income communities will have difficulty receiving and/or affording all of the doses. “It’s unlikely that the vaccine is going to be the panacea for controlling dengue,” he says. 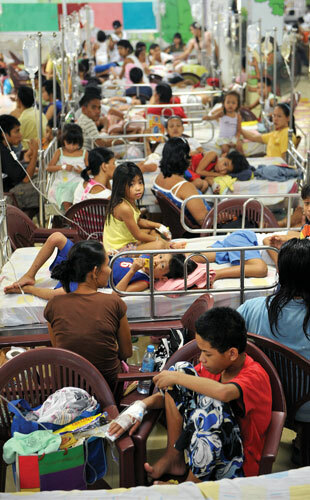 KIDS AT RISK: Young victims of dengue fever crowd the children’s ward of the government-run Quirino Memorial Hospital in Manila on September 11, 2010. © AFP/GETTY IMAGESIn the absence of an effective vaccine or a halt to mosquito breeding, clinicians have honed the art of treating severe disease. With no infection-specific protocol, doctors treat severe disease by compensating for lost fluids, which is akin to constantly pumping up a punctured tire. The challenge is to maintain a patient’s blood pressure at a high enough level to circulate blood without going too far and “popping” the system, thus causing life-threatening edemas that saturate the lungs or brain. This is tricky to do in adults, but even trickier in infants and children, who are more likely to develop the disease. However, more and more doctors are beginning to learn best practices for controlling the disease. In Bangkok, where Thai clinicians are at the forefront of clinical case management, a 20 percent mortality rate of dengue-infected patients in the 1960s is now down to just 0.1 percent. Doctors and nurses convene after each death to discuss in painstaking detail what went wrong. Clinicians now have such a fine understanding of the physiology of the disease—and how to track and control it by monitoring vital signs and urine output, and administering delicate fluid therapies while monitoring plasma volume—that death is avoidable, says de Silva. In Nicaragua, Harris and UC Berkeley-based researcher Josefina Coloma are working with an international nonprofit group to spur grass-roots community projects to educate residents about the mosquito life cycle, and to motivate them to eliminate standing water that can be a breeding ground for Ae. aegypti. Their preliminary findings showed that community efforts were able to reduce dengue infection. Simply informing people of the link between standing water and disease transmission has had an important impact, Harris says.